Cancellation Policy: Cancel by 4 PM local hotel time at least 72 hours prior to arrival to avoid a 1 night cancel penalty charge. Villa reservations must be cancelled at least 7 days prior to arrival or you will be charged for one night’s room and tax. A $35 processing fee will be charged with every Villa cancellation. General Policy: -Early Check out Policy - Cancellation policy applies to early check out -- full room and tax charged if early check out occurs within cancellation period -Late Checkout Policy - based upon availability - fees apply -Guest must be 21 years of age to reserve a room. A $25 Resort fee, plus tax applies for each night of your stay for rooms at the main lodge and a $50 Resort fee, plus tax for Villa accommodations. Deluxe Guest Rooms include two full sized beds with a crisp cotton duvet wrapped around an innerloft feather blanket. The rooms are all non-smoking and feature furniture inspired by an eclectic collection of lake country-style estate homes. Other features include a mini-refrigerator, a LCD flat screen TV as well as a TV imbedded in the bathroom mirror. Baths feature granite top vanities, make-up mirror and bath amenities from our own WELL Spa + Salon. All rooms have a furnished private balcony or patio. All rates exclude a daily resort fee of $25.00 plus tax. 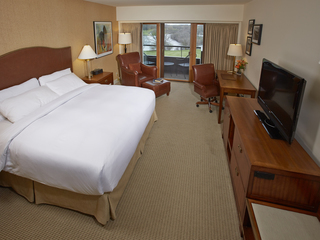 Deluxe Guest Rooms include two full sized beds with a crisp cotton duvet wrapped around an innerloft feather blanket. The rooms are all non-smoking and feature furniture inspired by an eclectic collection of lake country-style estate homes. Other features include a mini-refrigerator, a LCD flat screen TV as well as a TV imbedded in the bathroom mirror. Baths feature granite top vanities, make-up mirror and bath amenities from our own WELL Spa + Salon. All rooms have a furnished private balcony or patio. Highlighting the room are stunning views of the resort's lake and golf courses. All rates exclude a daily resort fee of $25.00 plus tax. Deluxe Guest Rooms include one king bed with a crisp cotton duvet wrapped around an innerloft feather blanket. The rooms are all non-smoking and feature furniture inspired by an eclectic collection of lake country-style estate homes. Other features include a mini-refrigerator, a LCD flat screen TV as well as a TV imbedded in the bathroom mirror. Baths feature granite top vanities, make-up mirror and bath amenities from our own WELL Spa + Salon. All rooms have a furnished private balcony or patio. All rates exclude a daily resort fee of $25.00 plus tax. Deluxe Guest Rooms include one king sized bed with a crisp cotton duvet wrapped around an innerloft feather blanket. The rooms are all non-smoking and feature furniture inspired by an eclectic collection of lake country-style estate homes. Other features include a mini-refrigerator, a LCD flat screen TV as well as a TV imbedded in the bathroom mirror. Baths feature granite top vanities, make-up mirror and bath amenities from our own WELL Spa + Salon. All rooms have a furnished private balcony or patio. Highlighting the room are stunning views of the resort's lake and golf courses. All rates exclude a daily resort fee of $25.00 plus tax. King Suites are an oversized deluxe room with one king sized bed with a crisp cotton duvet wrapped around an innerloft feather blanket.. A mini-refrigerator, queen size sofa sleeper (limited availability), LCD flat screen television and wireless high-speed internet is also included. Baths feature a television imbedded in the bathroom mirror, marble top vanities, make-up mirror and bath amenities from our own WELL Spa + Salon. Exclusive Geneva Club access is also included with the King Suite and features breakfast each morning, light afternoon snacks and hors d' oeuvres in the evening (not applicable with contracted group/wedding rates). All rates exclude a daily resort fee of $25.00 plus tax. 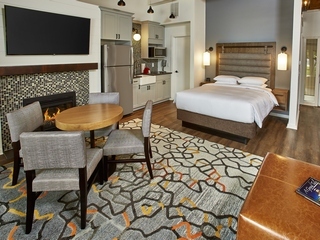 Junior Suites include one king sized bed with a crisp cotton duvet wrapped around an innerloft feather blanket.. Two over-stuffed chairs with ottomans face a beautiful gas fire place. A mini-refrigerator and wet bar, a 42” LCD flat screen TV, and wireless high-speed internet is also included. Baths feature granite top vanities, make-up mirror, and bath amenities from our own WELL Spa + Salon. New to the room is a television in the bathroom, imbedded in the mirror. Highlighting the room are stunning views of the resort's lake and golf courses via outdoor patio or balcony. Perfect for a romantic getaway. Exclusive Geneva Club access is also included with the Junior Suite and features breakfast each morning, light afternoon snacks and hors d' oeuvres in the evening (not applicable with contracted group/wedding rates). All rates exclude a daily resort fee of $25.00 plus tax. The Premier King Suite includes one king bed with a crisp cotton duvet wrapped around an innerloft feather blanket. and an LCD flat screen television in the bedroom area. The living room is fully secluded by pocket doors and includes a queen sized sofa bed, fireplace, an additional LCD flat screen television and updated wet bar complete with granite counter tops, island with stools and a mini-refrigerator. Bathrooms are now larger and feature invigorating showers with four shower heads and oversized, jetted tubs. Bathrooms also feature a television imbedded in the bathroom mirror, marble top vanity, make-up mirror and bath amenities from our own WELL Spa + Salon. 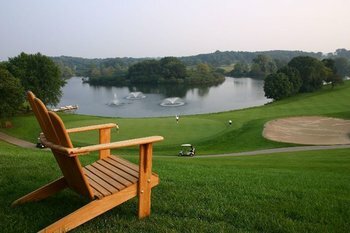 The room is completed by stunning views of our private lake and golf course via a furnished private patio. Wireless high-speed internet is also included. Exclusive Geneva Club access is also included with the Premier Suite and features breakfast each morning, light afternoon snacks and hors d' oeuvres in the evening (not applicable with contracted group/wedding rates). All rates exclude a daily resort fee of $25.00 plus tax. 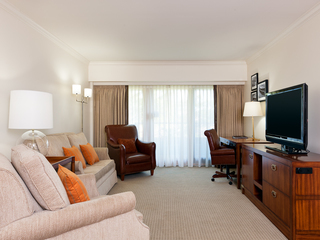 The Premier Suite includes two full sized beds with a crisp cotton duvet wrapped around an innerloft feather blanket and an LCD flat screen television in the bedroom area. The living room is fully secluded by pocket doors and includes a queen sized sofa bed, fireplace, an additional LCD flat screen television and updated wet bar complete with granite counter tops, island with stools and a mini-refrigerator. Bathrooms are now larger and feature invigorating showers with four showerheads and oversized, jetted tubs. Bathrooms also feature a television imbedded in the bathroom mirror, marble top vanity, make-up mirror and bath amenities from our own WELL Spa + Salon. The room is completed by stunning views of our private lake and golf course via a furnished private patio. Wireless high-speed internet is also included. Exclusive Geneva Club access is also included with the Premier Suite and features breakfast each morning, light afternoon snacks and hors d' oeuvres in the evening (not applicable with contracted group/wedding rates). All rates exclude a daily resort fee of $25.00 plus tax. 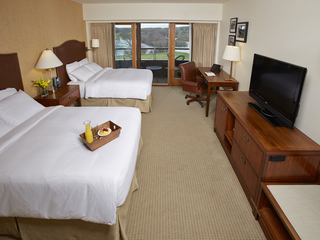 Deluxe Guest Rooms include two full sized beds with a crisp cotton duvet wrapped around an innerloft feather blanket.. 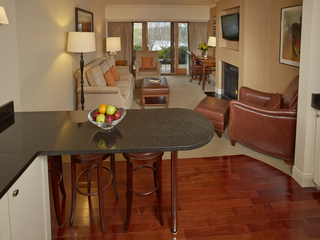 The rooms are all non-smoking and feature furniture inspired by an eclectic collection of lake country-style estate homes. Other features include a mini-refrigerator, a LCD flat screen TV as well as a TV imbedded in the bathroom mirror. Baths feature granite top vanities, make-up mirror and bath amenities from our own WELL Spa + Salon. All rooms have a furnished private balcony or patio. Highlighting the room are stunning views of the resort's lake and golf courses. Accessible rooms also include elevated toilets, grab bars, convenient light switches as well as handheld/adjustable shower heads. Shower chairs and shower transfer benches are available upon request. All rates exclude a daily resort fee of $25.00 plus tax. Deluxe Guest Rooms include one king bed with a crisp cotton duvet wrapped around an innerloft feather blanket.. The rooms are all non-smoking and feature furniture inspired by an eclectic collection of lake country-style estate homes. Other features include a mini-refrigerator, a LCD flat screen TV as well as a TV imbedded in the bathroom mirror. Baths feature granite top vanities, make-up mirror and bath amenities from our own WELL Spa + Salon. All rooms have a furnished private balcony or patio. Highlighting the room are stunning views of the resort's lake and golf courses. Accessible rooms also include elevated toilets, grab bars, convenient light switches as well as handheld/adjustable shower heads. Shower chairs and shower transfer benches are available upon request. All rates exclude a daily resort fee of $25.00 plus tax. Encompassing visual elements of the beautiful outdoors, you will feel miles away from everything amidst the scenic views and secluded environment in the cozy studios that sleep up to two guests. 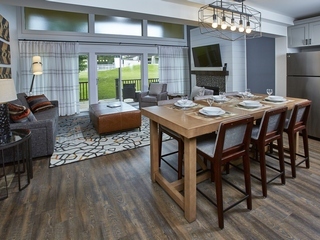 Studios feature one queen size bed along with full kitchens (excluding dishwasher) with stone countertops, gas fireplace, bathroom with oversized shower and furnished outdoor sitting area with scenic wooded views. Just off the sitting area you can access a pool and outdoor fire pit area exclusive for villa guests only. Reservations must be cancelled at least 7 days prior to arrival or you will be charged for one night’s room and tax. A $35 processing fee will be charged with every Villa cancellation. Rollaways not available. All rates exclude a daily resort fee of $50.00 plus tax. The spacious one-bedroom villa sleeps up to four guests. Featuring a private bedroom with king size bed and a master bath with oversized shower along with a queen sofa sleeper in the living area. One-bedroom's feature full kitchens with stone countertops, second bathroom, and outdoor furnished sitting area that leads to the pool and outdoor fire pit area exclusive for villa guests. 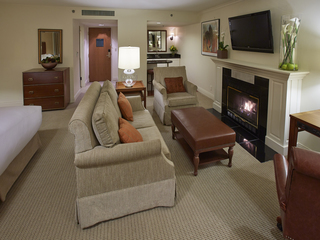 Most one-bedroom villas have gas fireplaces. Reservations must be cancelled at least 7 days prior to arrival or you will be charged for one night’s room and tax. A $35 processing fee will be charged with every Villa cancellation. Rollaways not available. All rates exclude a daily resort fee of $50.00 plus tax. The two-bedroom villas sleep up to six guests. Featuring two private bedrooms one with a king size beds and a queen sofa sleeper in the living area. Two-bedroom's feature full kitchens with stone countertops and furnished outdoor sitting area to soak in the beautiful Wisconsin views that lead to the pool and outdoor fire pit area exclusive for villa guests. 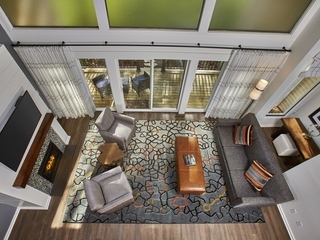 Most two-bedroom villas have gas fireplaces. Reservations must be cancelled at least 7 days prior to arrival or you will be charged for one night’s room and tax. A $35 processing fee will be charged with every Villa cancellation.Rollaways not available. All rates exclude a daily resort fee of $50.00 plus tax. The over-sized three-bedroom villas sleep up to eight guests with three private bedrooms. The bedrooms have king size beds and a queen sofa sleeper in the living area. Three-bedroom villas feature full kitchens with stone countertops and some villas also include a soaking tub (limited availability), gas fireplace and furnished outdoor sitting areas that lead to the pool and outdoor fire pit area exclusive for villa guests. Reservations must be cancelled at least 7 days prior to arrival or you will be charged for one night’s room and tax. A $35 processing fee will be charged with every Villa cancellation. Rollaways not available. All rates exclude a daily resort fee of $50.00 plus tax.